In honor of our favorite Fridays of the year we play a little Friday the 13th for the NES. Feel free to check out our review of it as well. 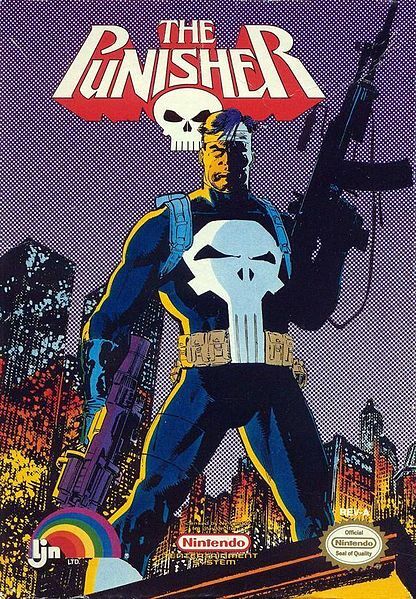 In probably one of the most doomed to fail ideas, I have to admit that in my childhood The Punisher was my first taste of what would later establish a love for light gun and first-person shooters alike. Ironically, this title is neither. It takes the crosshair light gun motif we first saw in Operation Wolf and adapts it into a third-person shooter (without light gun) that integrated upgrades and even brawler elements to an otherwise rote shooter title. Released in 1990, and despite the common license and title that holds no similarity to other games, The Punisher was a licensed LJN game that proved you shouldn’t judge a book by its cover. In short, I loved this flawed, aggressive shooter. Your task is to take down some of the biggest criminals the city has to offer, including longtime Punisher nemesis Jigsaw, in a series of levels. Interestingly enough, you aren’t forced into linear progression; the game allows you to choose any of the three initial targets to go after. As you take out each one, the remaining two targets become available levels until your final option, Kingpin, becomes the only level and boss. With each target you are given two levels to conquer, each containing power-ups, ammo, and grenades to help build up your arsenal, and a final encounter with the target themself. Unfortunately the power of choice, at least for me, is tarnished by the fact that doing the levels in their obvious order (from left to right) seems to be the only viable way to complete the game. Along the way you will take out a massive army of the game’s three or four enemy types and eventually make your way to a boss. The biggest hurdle is that if you run out of lives, it’s game over. No continues, no second chances. This isn’t really a deal breaker, it just establishes long bouts between attempts to finish the game.